In the last 10 years, he has secured over $24 million in research funding. John has been awarded 8 NHMRC Project grants (4 as CIA in the last 5 years), 2 NHMRC CRE (“Closing the gap in Indigenous Lung Health” and “Severe Asthma”), and 1 NHMRC Development Grant. He currently holds NHMRC grants of $7.5 million, including $2.96 million as CIA. 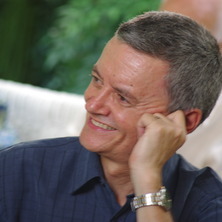 John was regularly an invited (9x), plenary (3x) and Chair (9x) at national and international conferences in the last 5 years. In recognition of his international standing and influence in the field, he was elected Fellow of the American Academy of Allergy, Asthma & Immunology (2004) and the Thoracic Society of Australia and New Zealand (2015). John is a key member of both the Severe Asthma CRE Management Committee and the Research Committee, and has played a leadership role in organising and co-chairing three recent national symposia on severe asthma to facilitate research collaboration, build research and clinical capacity, and improve models of care for severe asthma. He has been a member of multiple advisory boards to pharmaceutical companies, both international and national (AstraZeneca, GSK, Novartis, Nycomed, Boehringer-Ingelheim, Mundipharma, Menarini), and has provided advice to the Pharmaceutical Benefits Advisory Committee. His research has provided new treatment options for severe asthma, and guided the appropriate length of antibiotic treatment for Indigenous children with pneumonia, protracted bacterial bronchitis and bronchiectasis. John's research will inform best use of influenza vaccination in COPD, and guide the use of conjugate vaccines to improve immunity to Haemophilus in Indigenous children. He contributed to Clinical Practice Guidelines for the use of omalizumab and mepolizumab in Australia and he was part of the working group that prepared a web-based Severe Asthma Toolkit for the Severe Asthma CRE. Our program of translational research is focussed on the study of immune function and dysfunction in asthma, and host defence against respiratory viruses, especially human rhinoviruses. We are interested in the mechanisms leading to excessive airway inflammation in asthma, and why people with asthma are unusually susceptible to asthma attacks during respiratory viral infections. Our aim is to discover new therapeutic targets in severe asthma. The role of polarizing cytokines such as IL-33, IL-25 and TSLP in altering host defence against viruses. Vitamin D in asthma: is the golden bullet losing its luster? Remission of asthma: the next therapeutic frontier? Are rhinoviral proteinases responsible for mixed T(H)1 and T(H)2 immunity in chronic obstructive pulmonary disease? Grass pollen allergy in Queensland: How important are the subtropical grass pollens for triggering allergic rhinitis and asthma? Improving asthma through lifestyle interventions: how much exercise is best? Protracted bronchitis in children: what is the natural history and role of innate immunity dysfunction? The role of interferon regulatory factor 3 and 7 in virus-induced bronchiolitis and the onset of asthma.